The Yealink W60P can support up to 8 DECT phones and 8 simultaneous calls and each handset is capable of 30 hours of talk time and up to 400 hours of standby time. It also has a very sharp looking 2.4" (240 x 320 pixel) LCD color display. 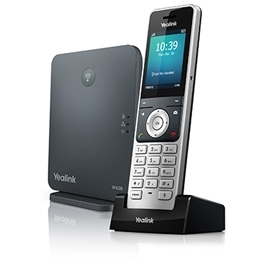 In this review for the Yealink W60P we will look at the pros and cons for this IP DECT phone system along with specifications, setup information and user reviews. It is worth noting up front that the W60P package consists of the W60B Base and the W56H Handset. Yealink fixed the biggest issue on the older W56B base station which could only support 5 handsets and 4 simultaneous calls. The W60B base can support up to 8 handsets and 8 simultaneous calls which should be enough for most small and medium sized businesses. Note that there is a maximum of 2 simultaneous calls per handset. The W56H handset is sleek and has a good sized 2.4" color display (240 x 320 pixels) and is comfortable to hold. The belt clip is a nice touch too. The phone menus are fairly intuitive which is nice as some DECT phones can be troublesome. It was straightforward to put the phone on hold, transfer a call or even conference in a third party. Battery life for the W56H handset is impressive, with 30 hours of talk time and 400 hours standby. It also has a quick charging time, 10 minutes charge results in 2 hours of talk time. Indoor range is 20 to 50m while the outdoor range is a very respectable 300m. Up to 5 repeaters can be utilized per base station to increase the range. The repeater is a separate device from Yealink (e.g Yealink RT20U) that is used to extend the range of the base station. Features an industry standard 3.5mm headset jack as opposed to the non-standard 2.5mmm jack that was used on the W52P. Unlike some Yealink desk phones, power supplies are standard so there is no need to purchase separate power supplies. PoE (Power over Ethernet) is also supported in the event you prefer to use that feature instead of a power supply. The handset charging station (or dock) is powered by USB. Yealink does supply a USB power adapter that you can use to connect to a power socket but since this is USB you can also power it from any USB port. Over The Air (OTA) handset upgrades are supported so new features and bug fixes can easily be applied to the handset from the base. 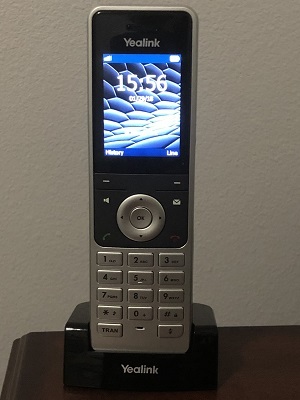 The W56H handset also has keys to mute, turn on speakerphone, access voicemail and transfer calls. Also you can set the phone to answer as soon as it is lifted from the cradle, thus saving a key press. 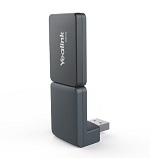 UPDATE May 2018: Yealink now sells the Yealink DD10K USB dongle. 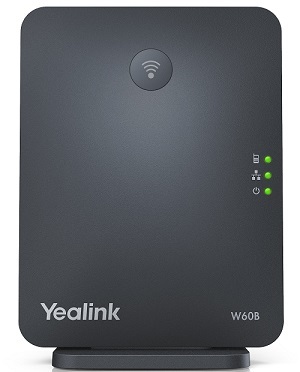 This can be used to wirelessly connect the W60B DECT Base to the Yealink T41S IP Desk Phone. For those with minimal Ethernet connections across an office, this can be a great way to add a high-end desk phone without needing WiFi or wired Ethernet ports in your office. The model numbers are confusing, mainly because they are out of sync. In other words, most of the design is now going into the base rather than the handset hence the reason the W60P consists of a W60B base and W56H handsets. This is just personal preference but the handset power cradle is very upright so it is easy to miss the connector when placing the handset into the cradle. Very good choice if you need mobility or lacking Ethernet ports. Supports up to 8 handsets and 8 simultaneous calls. Reasonably priced at $180 for the W60P (base and handset). Additional handsets cost $99 so it can get expensive to expand your system. The W60P is a relatively low cost solution for those needing mobility around the office or if your business has a lack of Ethernet ports. It charges quickly and supports up to 30 hours of talk time on one full charge. The range is impressive and the W60P can handle more handsets and concurrent calls than the W56P. W60P Package consists of one base unit W60B (see Figure 2) and one W56H DECT phone (shown in Figure 3). The setup and installation is similar to other Yealink devices and is therefore very straightforward. After powering on the base station and the handset, make sure that the handset registers with the base. It should do this by default without issues but for completeness we will explain the steps needed below if it does not register. 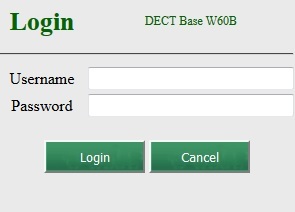 Assuming your network is using DHCP the base station should have been assigned an IP address from your router and you should be able to access the phone portal using a Web browser. To see the IP address that was served, press the "OK" button on the handset, then select "Status" and then "Base". The IP address should be displayed along with other information such as MAC address and firmware version. We will now assume that you have credentials from your VoIP company and will use these in the following steps in order to register with their PBX server. In this example, we will manually provision the phone rather than auto provisioning. 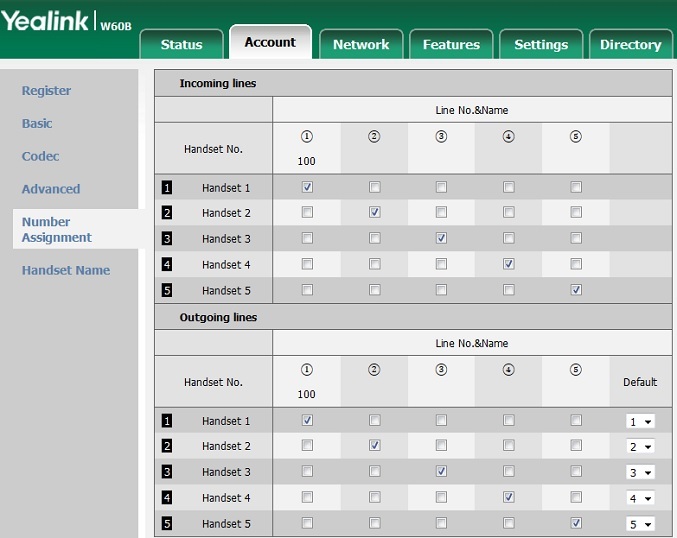 If your service provider supports auto provisioning you can view how to do this on our Yealink W56P review. Label - this is typically what shows up on the phone display but note that it does not appear on the W60P. 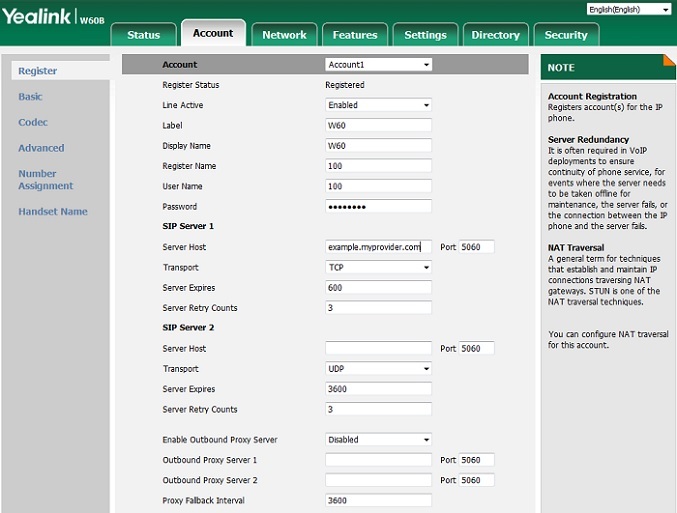 SIPServer1 - configured on the PBX or given by your service provider, e.g. example.myprovider.com. After entering the information above, hit confirm and your device should register and be ready for make and receive phone calls. Upgrading firmware can be achieved through a download from the Yealink website and then going to the "Settings" tab and then selecting the "Upgrade" menu. The W60B base station can support up to 8 handsets. In a typical home enviroment you often have 4 or 5 handsets scattered around your house and they all are tied to the same phone number. The W56H handsets are for business use and as such are much more powerful. One very useful feature worth mentioning is that each handset can have it's own line/extension, or access to shared lines. The above diagram is pretty self explanatory. Simply check the box for each line that you want each handset to have access to for incoming and outgoing calls. Note that each line is configured by adding new line information to the "Accounts -> Register" menu. Also worth noting is that it is easy to assign each handset a name (see Handset Name in Figure 6). This name shows up on the handset display so you can see which phone belongs to which person in your office. The W60B supports 8 handsets so it is a little strange that only 5 handsets are shown in Figure 6. We believe newer firmware may be required in order to see all 8 (yet to be released) as this looks the same as the W56P. The W60P base and handset package is a nice upgrade from the W56P and perfect for those that need mobility in the office or lack Ethernet ports. The W60B supports up to 8 handsets and 8 concurrent calls, making it suitable for most small and medium sized businesses. We're sorry, there are currently no user submitted reviews for Yealink W60P matching your search criteria at this time. Please add your own review or check back later as reviews are being submitted often.